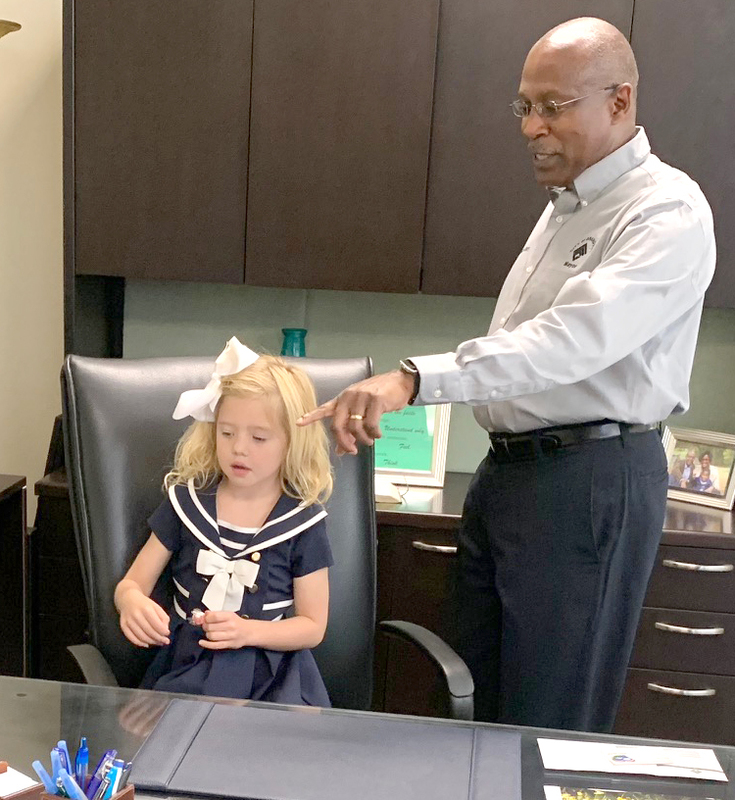 Mayors across the state of Missouri are showing their sweet side as one five-year-old girl invites each of them to meet her for an unforgettable treat. Taylor Duncan, the “almost six-year-old,” as she’d tell you, from Waynesville, is on a mission to meet every mayor in Missouri while learning about each town and enjoying some ice cream along the way. 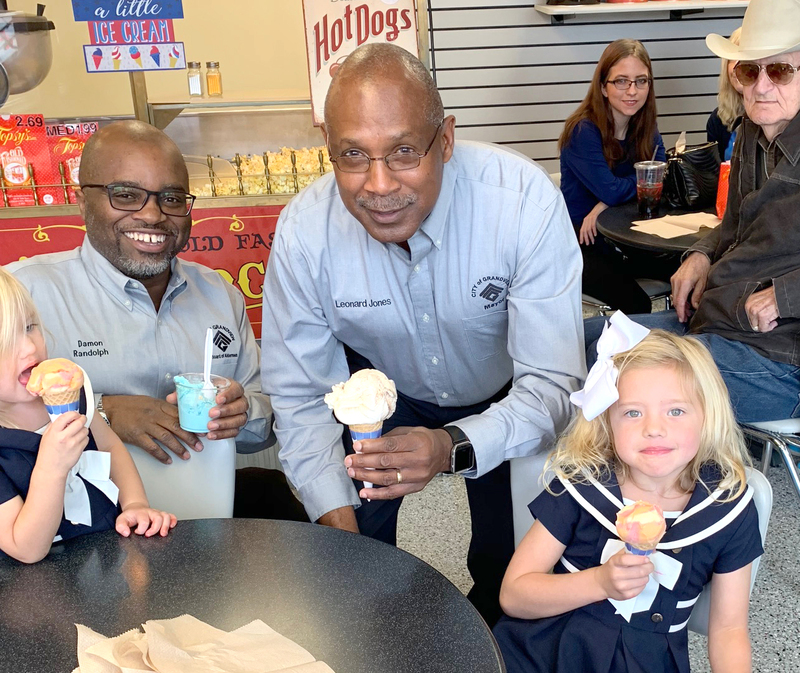 On Saturday, October 13, Taylor, her mother and younger siblings, visited Grandview Mayor Leonard Jones, her 116th mayoral ice cream visit, to be exact. 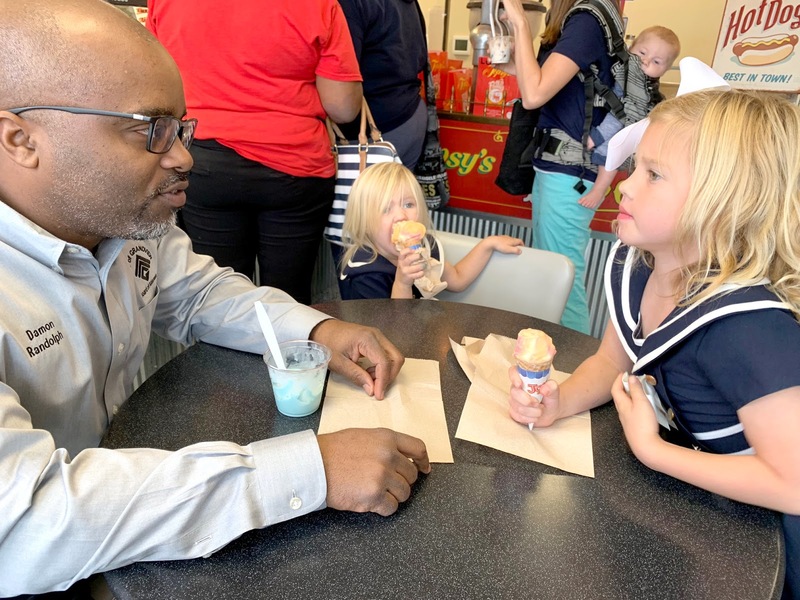 The idea came about when Taylor, who is homeschooled, was studying the state and learned that the ice cream cone originated in Missouri. So, she set a goal to have an ice cream cone with every mayor in the state. “It’s a really delicious idea,” she said through a big bite of her rainbow sherbet. Taylor toured the Truman Farm Home before heading over to Topsy’s with Mayor Jones for their special treat. 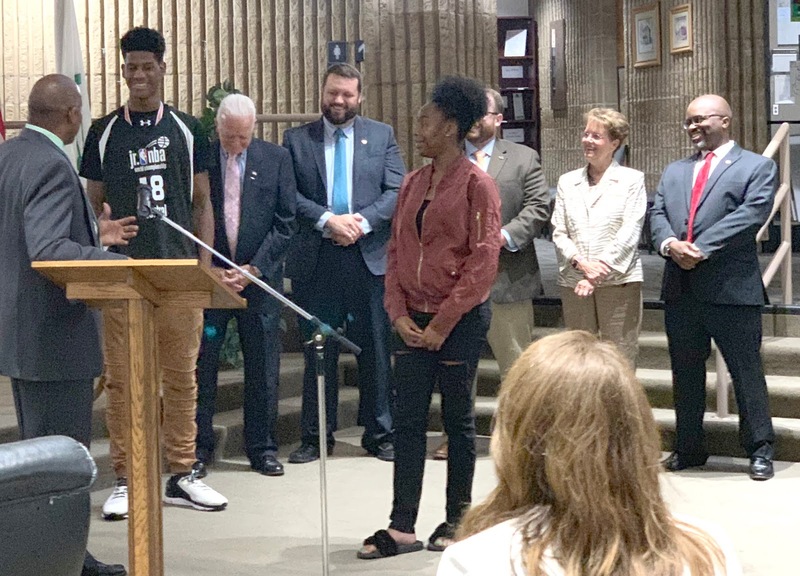 There, she also met Alderman Damon Randolph, and was excited to ask questions of both elected officials. Randolph, with bubblegum ice cream, and Jones, with his vanilla swirled with fudge and peanuts, answered questions from Taylor like why they decided to get into local politics, the biggest challenges, and what their favorite thing about living in Grandview is. When asked which mayor has been her favorite so far, Taylor responded, “Mommy asked me to not answer that question.” Her mom said that she’s supposed to answer the question differently than that, but Mayor Jones is convinced that he’s the favorite. 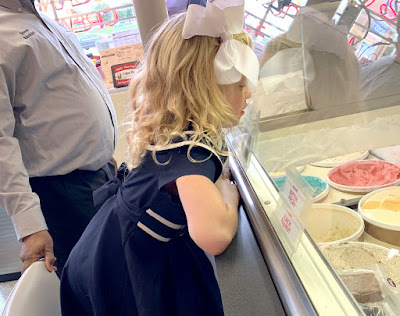 While she couldn’t answer which mayor she likes best, cotton candy ice cream is the flavor she chooses most. She also loves orange sherbet. 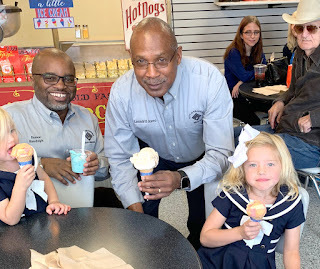 Following their treats at Topsy’s, Jones, Randolph and the Duncan family headed over to City Hall. There, Taylor was impressed with the size of Grandview’s municipal government building. She also sat at the mayor’s desk and played at Freedom Park. After Grandview, the family was headed to Oak Grove. Taylor’s trek across the state is documented by her mom on a Facebook page. Follow her journey at Show Me Ice Cream. With sixteen ordinances to get through in one meeting, the Grandview Board of Aldermen had a stacked agenda before them for their regular session on Tuesday, September 25. In just over an hour, all 16 ordinances were approved, but not without opposition on a handful of items from one alderman. Maloney’s first opposition of the evening had to do with the construction of the city’s newest splash park, which will be located adjacent to The View community center. Grandview citizens approved a no tax increase bond vote in 2014 for the splash park for $2.25 million. The project had been tabled after the original bid came in over budget. Mega Industries will be responsible for construction in the amount not to exceed $1,859,653. The project will include spray features, playground with slides, site furnishings, cameras, and fencing. With Maloney’s no vote, the ordinance still passed 4-1 (Alderman Sandy Kessinger was absent from the meeting). Ward 3 Alderman Jim Crain stated that while the location of the splash park is not preferable to him, he is simply going along with the majority on his yes vote. Finally, Maloney also opposed the petition to establish a Community Improvement District (CID) for the Grandview Village Shopping Center, located on Main Street. The property owners propose to use the CID as an economic redevelopment tool to upgrade the center, demolish a vacant building (former Econo Lube), and build a next-generation Dairy Queen Restaurant (DQ Grill and Chill). It will impose a one percent sales tax upon all retail sales within the CID, all proceeds to be used for the redevelopment project. Despite 4-1 approval, Ward One Alderman Damon Randolph expressed concern that shop owners and managers didn’t seem to have any knowledge of the CID process for their buildings nor had any communication with the property owners. The project attorney said that he was surprised to hear that the tenants were unaware, but will ensure communication happens going forward. The first of the unanimously-passed ordinances included the construction of the shooting range to be installed next to the Grandview Ball Park, off of Arrington Road. Grandview citizens approved a no tax increase bond vote in 2014 for the shooting range in the amount of $750,000. An additional $250,000 was secured from the Land Water Conservation Fund, along with an additional $12,300 from earned interest on the bond. TRS Range Services, out of Idaho, will be responsible for construction, including handicap parking and walkways, shooters briefing building and storage shed, the range, a target turning system and fencing. With the project estimated to be completed in the spring of 2019, Grandview Police Chief Charles Iseman said that they plan to offer an education along with the opening to make patrons aware of the expectations and what will and will not be allowed at the public shooting range. “This is a new adventure for us, so there definitely needs to be an education piece to it,” said Iseman. Also approved at the meeting were the installation of a new roof at City Hall; a one-year extension to the Metropolitan Area Regional Radio System (MARRS) user agreement for all city radios along with software support for the Response CAD system, Police RMS and other public safety systems; an increase in charges for ambulance services ($900 for residents and $1050 for non-residents), an increase in the first-aid rate to $250 and an increase in the mileage charge to $14 per mile; and an ordinance to begin use of an electronic grant management system with the Federal Railroad Administration for the Blue Ridge Boulevard overpass replacement project. their sports and academic careers now and in the future.